Charitybazaar - OGU Volunteer Circle "TEAM MANNER"
We are collecting unused items and bazaar goods from the faculty and circle members. These goods are then to be sell in the charity bazaar at the Kishibe Festival (school festival). This activity had began by the junior college seminar students and adviser teacher for about ten years ago. It has now been taken over as a volunteer circle. Proceeds of these charity bazaar was donated to "the Japanese Red Cross Society" , "UNICEF" and "Doctors Without Borders" until 2010. Since 2011, we donated the entire amount to the Japanese Red Cross Society due to the Great East Japan Earthquake. We wanted to perform a construction aid in form of to be connected. It was "Reconstruction aid internship (Reconstruction Agency sponsorship)". In September 2014, 4 representatives members took part in Kesennuma reconstruction assistance intern of the reconstruction agency sponsored. We came up with the idea of a plan for "Kesennuma City (Miyagi Prefecture) elementary and junior high school book support "
Thanks to the person in charge of this school regional alliances , the advisor, Kesennuma City Board of Education and cooperation of Kinokuniya , We was able to do this book support to the elementary and junior high school in Kesennuma City. We will continue working on this activity in the future. For further information, access to "Kesennuma books support". During the Kishibe Festival (school festival) period, the predecessor of the team Manner, Osaka Gakuin Junior College School students, carry out a charity bazaar. A record sales of ?31,044were donated to 3 organizations "UNICEF", "Doctors Without Borders", "Japanese Red Cross Society". During the Kishibe Festival (school festival) period, the predecessor of the team Manner, Osaka Gakuin Junior College School students, carry out a charity bazaar in ☆ area. A record sales of ?15,458were donated to 3 organizations "UNICEF", "Doctors Without Borders", "Japanese Red Cross Society". During the Kishibe Festival (school festival) period, the predecessor of the team Manner, Osaka Gakuin Junior College School students, carry out a charity bazaar in A15 area. A record sales of ?31,252were donated to 3 organizations "UNICEF", "Doctors Without Borders", "Japanese Red Cross Society". During the Kishibe Festival (school festival) period, the predecessor of the team Manner, Osaka Gakuin Junior College School students, carry out a charity bazaar in A1 area. A record sales of ?31,416were donated to 3 organizations "UNICEF", "Doctors Without Borders", "Japanese Red Cross Society"..
During the Kishibe Festival (school festival) period, the predecessor of the team Manner, Osaka Gakuin Junior College School students, carry out a charity bazaar in A4 area. A record sales of ?27,372were donated to 2 organizations "Doctors Without Borders" and "Japanese Red Cross Society". During the Kishibe Festival (school festival) period, OGU volunteer circle "team manner" carry out a charity bazaar in A7 area. Since 2011, we donated the entire amount to the "Japanese Red Cross Society" due to the Great East Japan Earthquake. A record sales of \27,592 were donated to "Japanese Red Cross Society"
During the Kishibe Festival (school festival) period, OGU volunteer circle "team manner" carry out a charity bazaar. A record sales of ?39,759 were donated to "Japanese Red Cross Society". During the Kishibe Festival (school festival) period, OGU volunteer circle "team manner" carry out a charity bazaar in A1 area. A record sales of ?23,770 were donated to "Japanese Red Cross Society". During the Kishibe Festival (school festival) period, OGU volunteer circle "team manner" carry out a charity bazaar in B10 area. 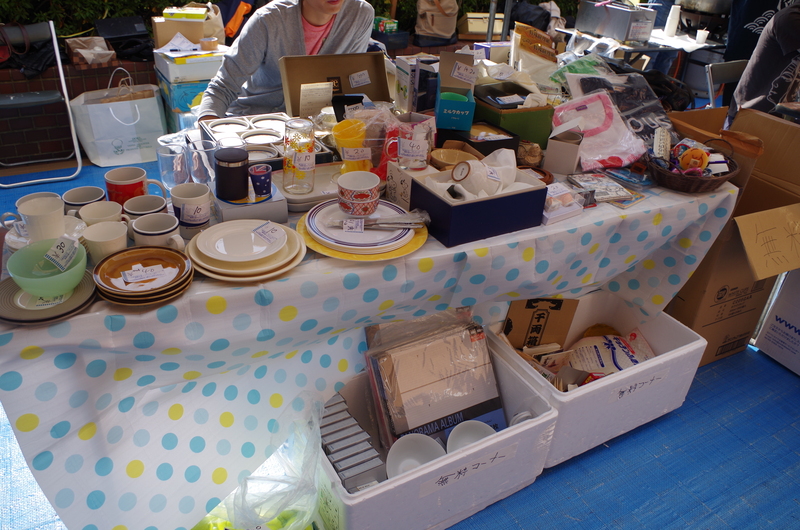 A record sales of ?37,086 were donated to "Kesennuma City Board of Education"
During the Kishibe Festival (school festival) period, a charity bazaar is conducted in B11 area. A record sales of ?33,656.